A Singaporean classic through and through, as disturbingly relevant now as it was then. There’s good reason why Off Centre is considered one of the most important works of the Singapore literary canon; the hallmark of a classic play lies primarily in its ability for both story and characters to transcend time, and Off Centre achieves all of these in spades, triumphantly returning to the stage as bold as it was 26 years ago when it was first staged. Directed by The Necessary Stage Artistic Director Alvin Tan both then and now, Off Centre broke new ground with its never before seen, brutally frank depiction of mental illness, and its multifaceted, realistic portrayal of those afflicted by it, painting them in a sympathetic but fallible light. 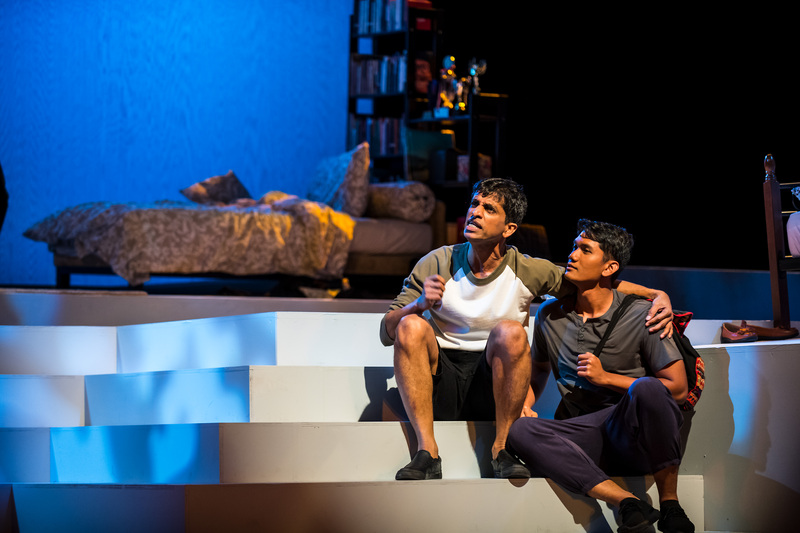 In many ways, Off Centre also marked the peak of playwright Haresh Sharma’s writing career, cementing The Necessary Stage’s position as a company that was willing to address the darker, unspoken aspects of Singapore society, bravely baring these onstage and putting a human face to these otherwise abstract sounding concepts to the ordinary citizen. Reprising their roles from the original staging, real life couple Abdulatiff Abdullah and Sakinah Dollah play 20-something year old protagonists Vinod and Saloma respectively, forming an unlikely but fast friendship in the solace from each other’s shared mental conditions and the resulting discrimination because of it. 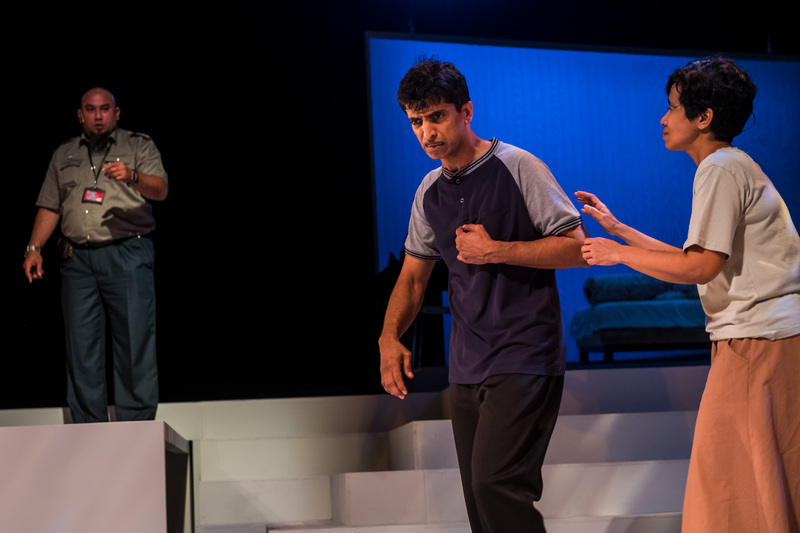 Over the course of the play, Off Centre systematically breaks down the various sectors of society perpetrating prejudice, from school to work, to even the army, illustrated by a condescending officer (Brendon Fernandez) who spits his disdain and disbelief at Vinod’s condition. 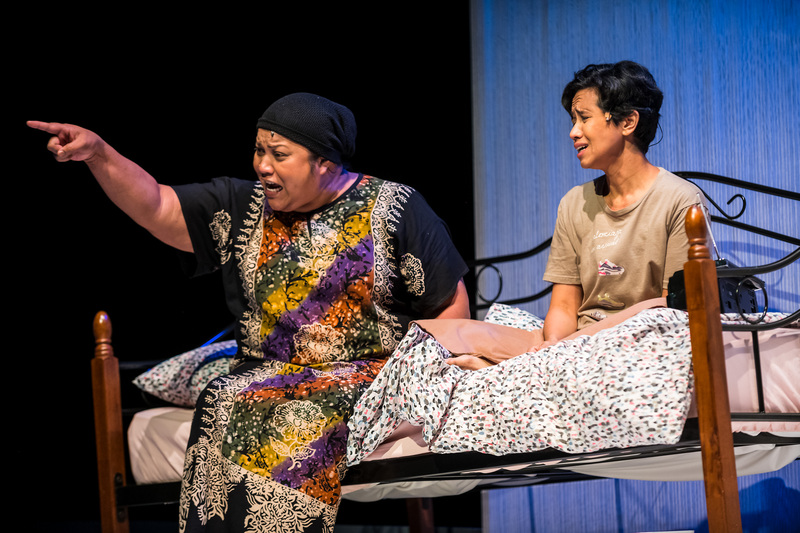 On the homefront, Saloma wrestles with her own frustrated widowed mother, played by Aidli Mosbit, who perfectly toes the line between overbearing and long-suffering parent, a cocktail of flaws and experiences that complicates her character beyond generic antagonist. 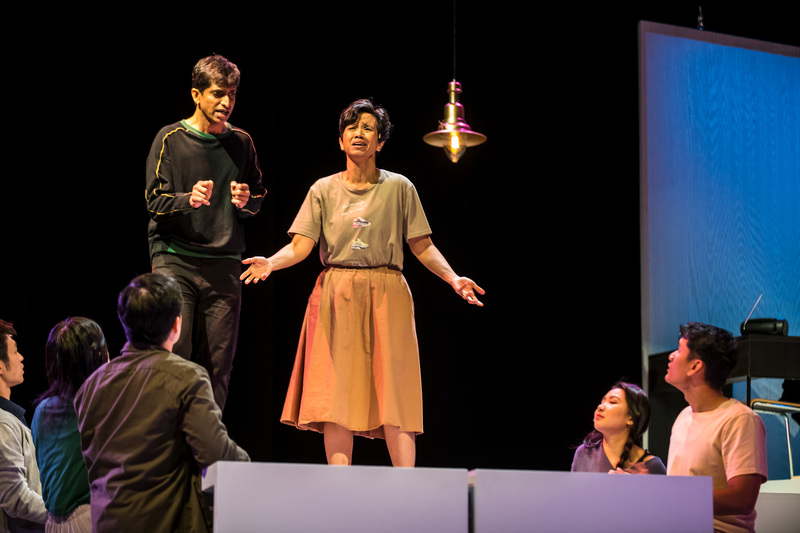 In the same vein, both Vinod and Saloma’s three-dimensional characterisation makes them more than just symbols of mental illness, their vastly different backgrounds and life views covering a spectrum of issues that plague not just the mentally ill, but Singapore as a whole, encouraging audiences to look beyond the illness to see the person behind it. Over its two hour run time, Off Centre packs in class divide, parenthood, religion, education, and more, somehow managing to touch on these issues without being heavy-handed, and generating genuine responses by portraying them as they are without moralizing. It helps of course, that Sharma’s script is also laugh out loud funny at the most unexpected of times, employing a mix of sarcasm, gallows humour and observational humour to balance out Off Centre’s darkest moments. Much of why this production of Off Centre is successful is because of its fantastic cast. It’s evident why both Latiff and Sakinah have returned to these roles after so long – despite their age, both actors still feel incredibly youthful as they move around the stage and in many cases, it feels almost as if the lines were written specifically for them, their onstage chemistry incredibly compelling as we watch their platonic relationship rise and fall, completely endearing audiences to these characters. 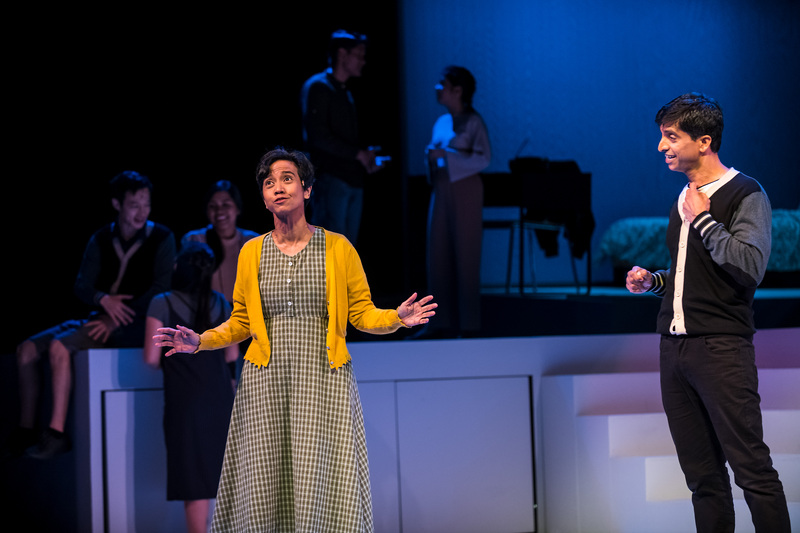 As Vinod, Latiff’s brash confidence is winsome, a stereotypical romantic lead with a twist as he continually coaxes Saloma into coming out of her shell. Sakinah, as Saloma, is arresting in her performance, her journey from shy girl into independent woman one we watch in earnest, while she seamlessly shifts her physicality and voice between her inner and outer selves. 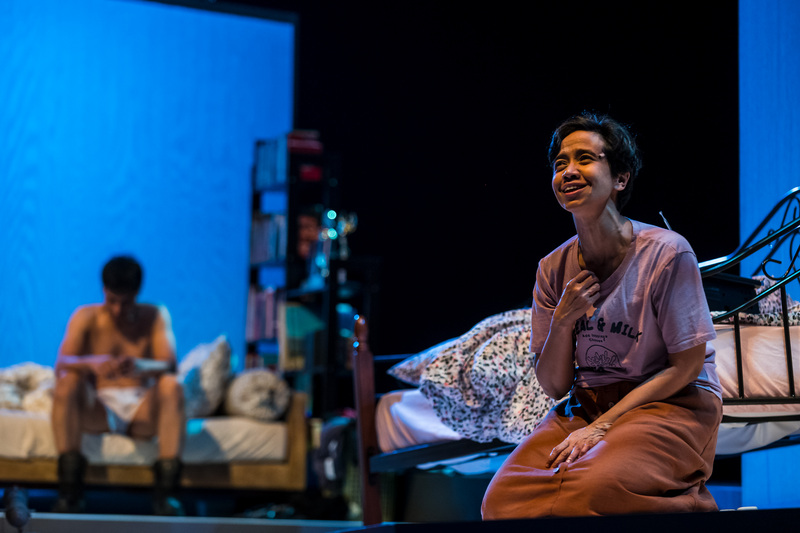 One of the most pertinent concepts in Off Centre is that of space, and despite the larger stage in the Victoria Theatre, Wong Chee Wai’s set and Yo Shao Ann’s evocative lighting work together effectively to close the gap between audience and performance as necessary. 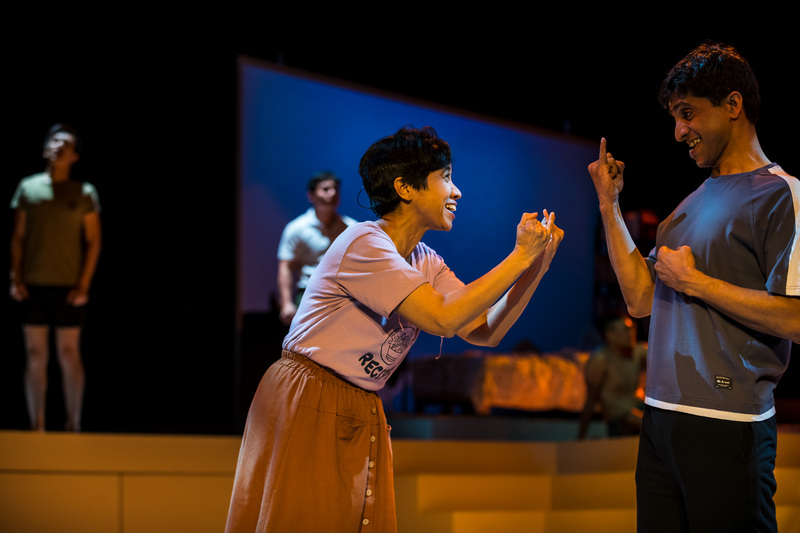 Wong’s set operates on multiple levels – Vinod and Saloma’s private, personal bedrooms are the furthest from the audience, making us feel distant from them when they retreat there, and it is the ‘void deck’ near the front of the stage where we feel closest to them, mentioned multiple times as Vinod and Saloma’s own private haven, empty and allowing both actors’ performance and expressions to best be seen and felt by the audience. By contrast, public spaces are hostile affairs, inviting curious stares or laughs from onlookers in restaurants, a sense of fear in the air as our protagonists struggle to keep their own paranoia and agoraphobia under control. 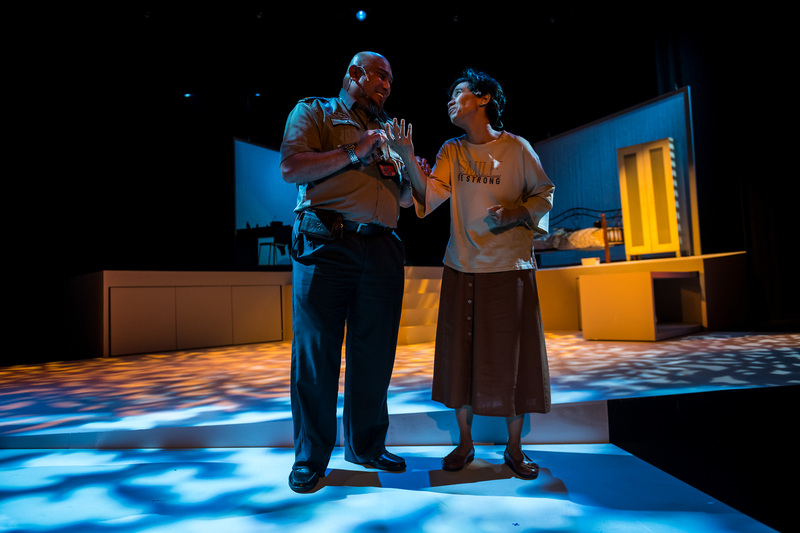 Off Centre never offers any easy answers, with characters who garner both love and hate with their often difficult behaviour and pessimistic world view. As we watch both Vinod and Saloma face one new challenge after another, one cannot help but feel devoid of any agency to help as we remain seated while they live out their fast spiralling lives. Yet, as bleakly as it ends, Off Centre’s decision to return to its opening scene of a single character sitting on the edge of the stage is a form of empowerment, for audiences to take a leap of faith as the lights come on not just to leave, but to offer a listening ear or even a helping hand. Above all, amidst the despair, Off Centre is hopeful, and a call to action to change the way we view the mentally ill, and by extension, people in society who go against the grain and don’t necessarily conform to societal norms. Still as relevant today as it was when it was first staged in 1993, Off Centre is a timeless production that continues to hit all the right notes with each new staging, a keen reminder why The Necessary Stage remains one of the most important local theatre companies around as they continue to exact societal change through theatre that moves, shakes, and empowers. Off Centre plays at the Victoria Theatre from 7th to 17th February 2019. Tickets are SOLD OUT.